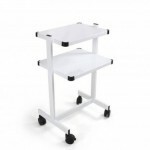 Trolmed trolley designed for medical devices and physioterapy equipment. Technical and design solution allows easy building of treatment sets and composed of various devices. 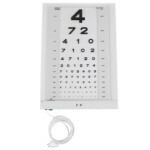 Illuminated eye test chart with remote control. Several available optotypes. Flexible (select row or single icons), reliable and easy to operate. Auto power-off. Featuring additional optotypes, (e.g. with symbols for children). The table is made of white metal parts and particle veneered board, covered with leather-imitating padding. There is an option to add a side shelf (where scales, toys or indispensable accessories can be placed) and a lower-shelf (for underwear and toiletries). PDG paravans are one of many indispensable pieces of equipment found in medical practices, surgery rooms, beauty centres and hospital units. The Meden-Inmed paravans can be either uniform or 3-section. They are very durable due to their metal frames. Their linen is easy to clean, as it is the so-called Medical fabric (50% cotton, 50% polyesther). The wheels of each of these paravans can be blocked. Exercise mattress makes it easier to achieve goals set by the therapist. Because of their various size, the given mattresses will be suitable for given situations. The offered exercise mattresses are made of polyurethane anti-crease foam and may be either uniform or three-part. There is quite a big range of colours of the padding which is durable and easy to clean. Medical stools increasing the comfort of carrying out either examination or treatment. 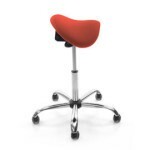 The stools are stable, but at the same time mobile, due to their durable, chrome-plated bases and rubber-covered wheels. There is a wide range of colours suited to the padding of Meden-Inmed rehabilitation tables. PDB is a balance platform meant to improve patient’s coordination, equilibrium and movements, but to enhance muscle- and ankle joint work as well.